Need a facial but short on time? This quick, yet highly personalized treatment will cleanse, exfoliate and revitalize your skin in just 30min. 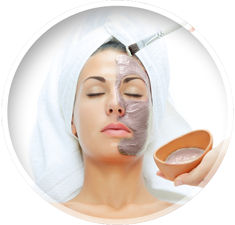 Have your pores deep cleaned and extracted or enjoy a skin rejuvenating facial massage. Your choice. Either way, you'll experience a treatment that leaves your skin feeling clean, smooth and revitalized. Want smoother, softer, retexturized skin but short on time? This advanced, ultimate strength "quick peel" contains potent acids and enzymes, to provide a powerful peeling of dulling surface cells in just 30 minutes. It's the fastes way to smooth out fine lines and wrinkles, leaving your skin feeling refreshed and younger looking. Need a lift? In just 30 minutes, this amazing express facial will tighten and firm your skin as it smoothes out surface wrinkles. Treatment includes a dual exfoliation and cleansing under steam followed by the ultra lifting Bioelements Faxx-C mask and an application of the perfect hydrating moisturizer. In just 30 minutes, this express treatment gives you a relaxing anti-aging eye treatment that includes a de-stressing acupressure massage, and a hydrating, cooling mask. The Fast Results Eye Smoother is perfect for brides or that special event where you need to look your best - or for anyone that doesn't have a full hour to spare. The results? Eyes that are fresh, bright, and younger looking.